As you would imagine years of collecting unique items has given the Wyman Museum many old and interesting displays. 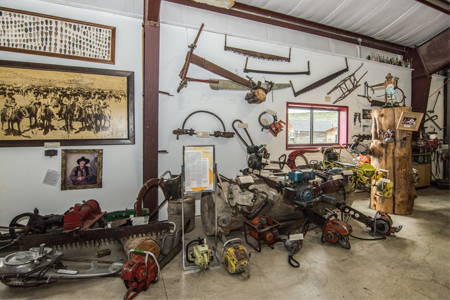 Some you may remember from your own childhood or stories your elders would tell; and some that tell their own story of the history in the Yampa Valley. You are going to love seeing them all. 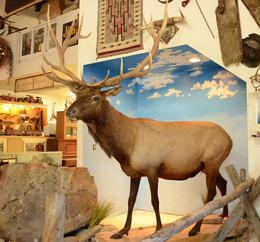 Clyde was the original elk mascot at the Wyman Museum. He was raised on the Wyman Elk Ranch on the Williams Fork river by Lou Wyman prior to opening the museum near Craig. Iron horses to dog treadmills...human ingenuity never ceases to amaze us. The Wyman Museum has a complete set of Colorado licence plates. 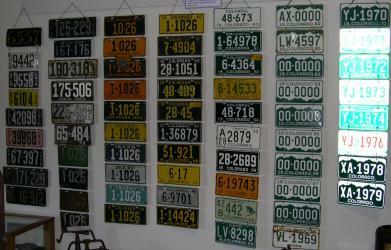 The licence plates start with a homemade licence plate from 1912 and end with one from 1979. We stopped with 1979 because stickers where introduced instead of the year being punched into the plate. From a push and a pull to a pull cord and some power, you will see it all. Carol Gossard restored the sheep wagon in 1976. 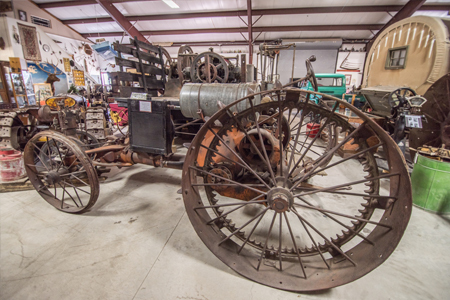 The top half of the wagon belonged to the Gossard family while the bottom half of the wagon belonged to the Gent family. Both families where from the Axial Basin area near Hamilton, Colorado. 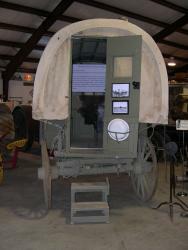 Carol Gossard donated the wooden-wheeled wagon to the Museum of Northwest Colorado. 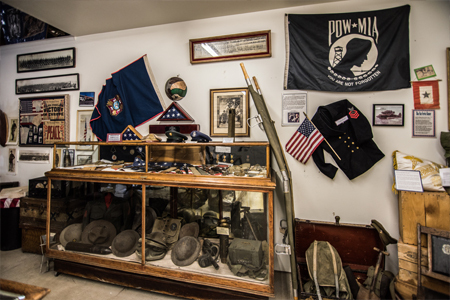 It is on loan from the Museum of Northwest Colorado to the Wyman Living History Museum. Something historical for everyone from our patriotic past. This hearse is the one used in Idaho Springs and Georgetown, Colorado. 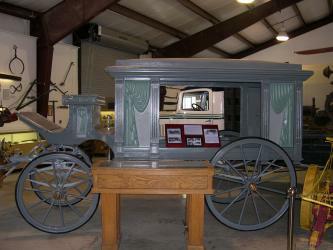 The hearse has been restored back to it's original colors. When this picture was taken the hearse was not finished being restored. Now that it is restored it is a beautiful sight.